As strong as season 5 of The Walking Dead has been for the most part, here we are with the mid-season finale, which delivered a very strong first five minutes and a compelling enough final five minutes (after the credits), with a lot of mixed material in between. Sure, shocking deaths are shocking (even with AMC’s social media team having done their best to ruin what happened hours before the west coast broadcast) and yes, the production is solid enough to make for some effective zombie-based action (which this show has always been capable of), but I honestly felt let down, given the strong set up in the prior weeks. These past several weeks I have been happy to give praise to a series that has fought an uphill battle to have its quality match its popularity. This week, I really wish it could have gone that extra mile and given us more than just shock value to talk about. Of course, this is not the first time The Walking Dead has struggled with its mid-season finale or even the conclusion to major arcs in the series, in general. 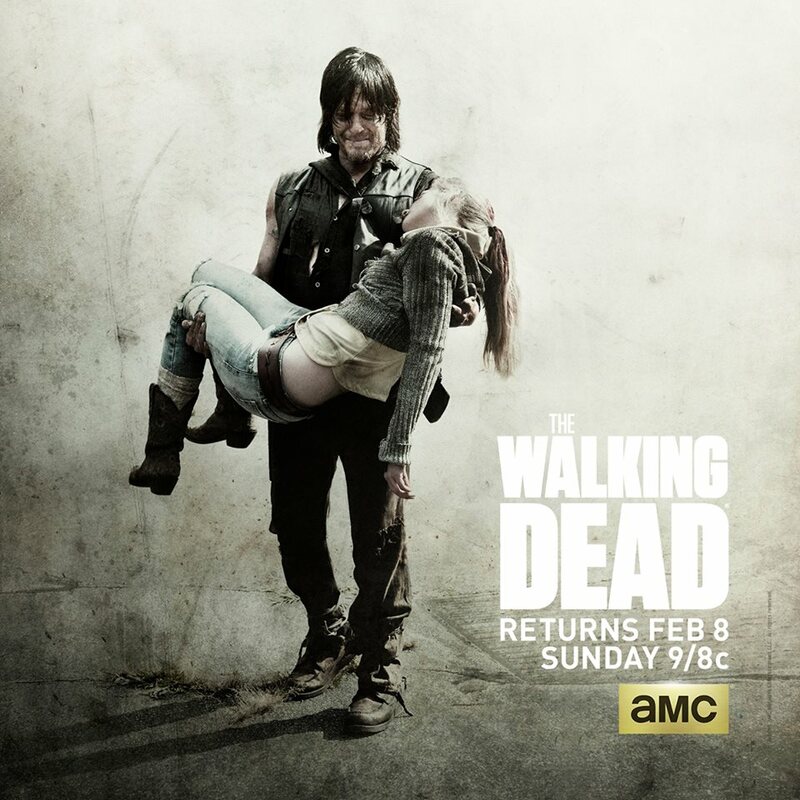 I had plenty of issues with the handling of the Governor and the way that was wrapped up last season. There have been various problems with the side plots occurring within certain storylines that take away from what could have otherwise been very solid episodes. That in mind, back in the farm days in season 2, the wrap up to the hunt for Sophia added up to a sad, but satisfying mid-season finale. The point is we have seen this series struggle with payoffs before and apparently, even when the series is at its best, there are still hiccups in how to find the right resolve. Last week was much stronger than I would have expected an episode like it to be, if one were just explaining it to me in broad terms. It was all setup for this week’s episode, “Coda.” We needed to see various characters get into certain positions, as it would lead to some end results in this episode. It worked well, because I have been given enough reason to care about a good majority of the characters on screen, namely the main cast members. This week, following a strong opening segment that reminds us of how Rick has changed over the course of this series and is much more interesting to watch in this sort of state, we spend a lot of time with one of the worst ‘villains’ of the series (Dawn) and have to deal with one of the worst journeys of a character (Father Gabriel). I have already made a statement about the character of Dawn last week, but to repeat myself: she does not work. The performance provides us with nothing to really care about, which is not necessarily the fault of the actor, given the script she has to work with, but at the same time, I have so little interest in this person, based on how this persona has been relayed to me, so it means nothing to me when it comes to lengthy scenes between her and Beth talking or the longing looks that she gives to the camera at times. I am all for characters talking and having quiet moments on this series, but having dead weight going on and on about her inability to maintain control for much longer, in a setting that I know will not matter anymore after this episode, means nothing to me. With Dawn in mind, everything that surrounds this plotline is essentially stalling. I can say I found plenty to enjoy in Rick’s handling of the exchange process. The build up to actually having him present his two hostages and move into the trade process was creepy and effective enough, but when it came down to the inevitable screw up that would keep things from running as smoothly as planned (has anything ever worked out exactly as planned on this show? ), I was left with more of a thought of “why?” to go along with the obvious shock, rather than a real understanding of the results being all that fitting. From an economic standpoint, sure, it makes sense to take Beth out of the equation. The rest of the cast has functioned quite well without her. 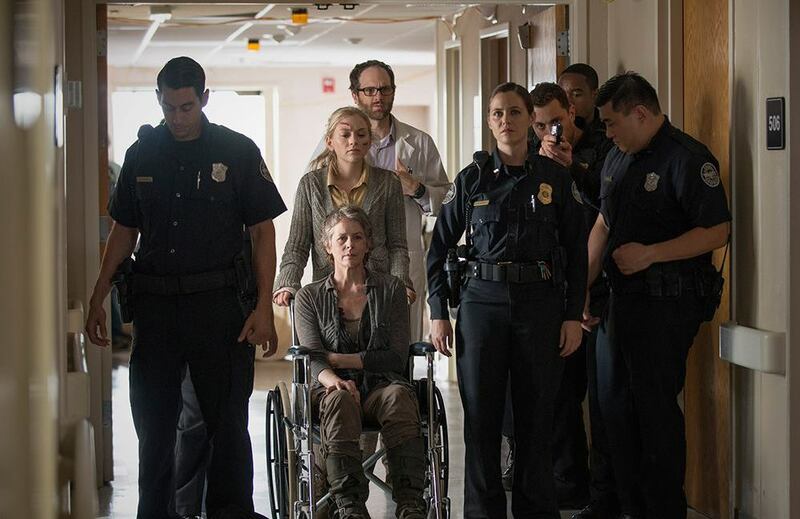 Still, even if I did not really enjoy the hospital episode, at least Beth was finally starting to become interesting as a character and may have been able to add a new dynamic upon rejoining the group. But that is all gone now and I am left with Maggie crying over the sister the show decided to just now remind her that she had. Sure, the cast is a little smaller now and it is always better to see The Walking Dead work with a smaller crew, rather than the whole ensemble within one episode (unless they are all fighting something at the same time), but shocking the audience for the sake of shock does not seem to work nearly as well as it does in the comics. I can see the counter to this amounting to an argument for the kind of relationship Beth had with Grady, but at the same time, I never cared for Grady Hospital, nor did I feel it was all that fleshed out. This was a place made up of jerk fake-cops, a complex doctor character held back from doing more, the escaped janitor and only character that we will get to see more of, an old guy that falls down a lot, and lame Dawn. With all of that in mind, I am at least glad we are now done with this place, but at the rate we were going, seeing more people fall down the elevator shaft may not have been all that bad. Giving us so much time in this setting makes a level of sense, when looking at how this first half of the season was structured, but the delivery was not nearly as effective as it needed to be, in order to really have me consider this more than just a weak take on Beth’s purgatory. Now, as if to make things seem hilariously tilted in favor of having me provide more reasons as to why I have to point out flaws in the mid-season finale, moving on means talking about Father Gabriel and his mission to ruin things for everyone. 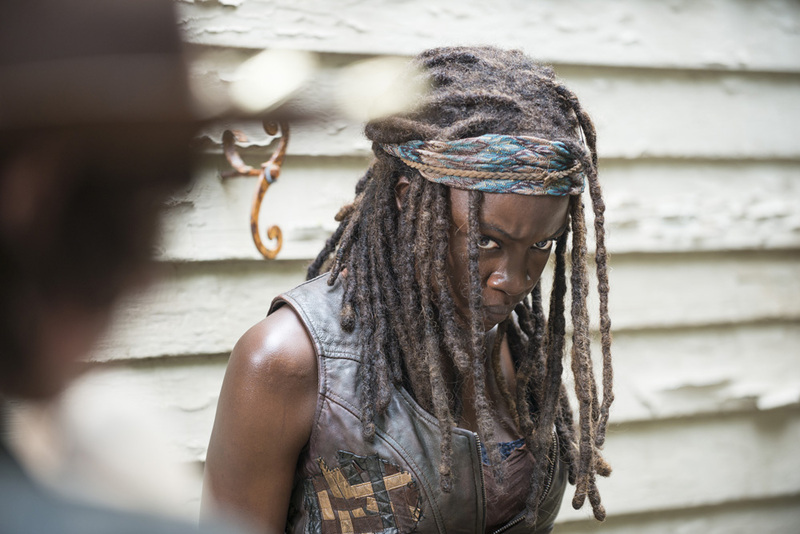 The best thing I can say is that this led to us getting to see Michonne in action, as she chopped up some zombies with her sword. That said, we still had to suffer through idiotic actions that led to the loss of a perfectly good shelter. There is a certain amount of logic that helps me to understand why this needed to happen, but that does not take away from the amount of eye-rolling I did, while watching Father Gabriel do one dumb thing after another, while leading every zombie back to his church. Again, whatever the symbolism the writers are going for is, it only goes so far, once I stop having much care for who is involved, based on the results and actions that took place. All that is really left to talk about is Morgan. 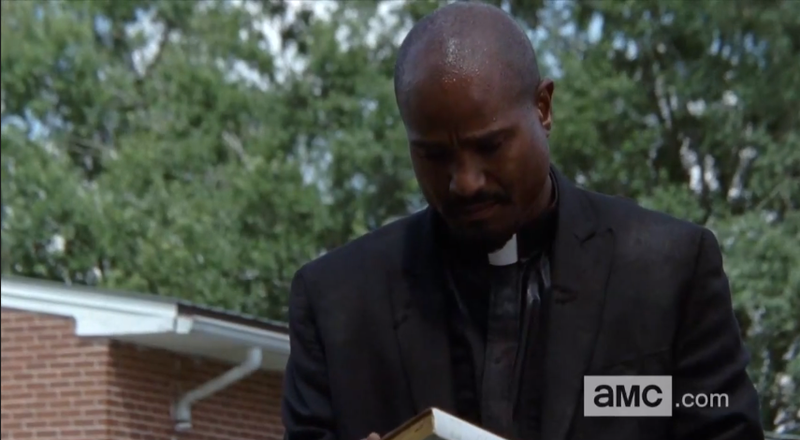 Yes, once again (like in the season premiere), if you did not keep watching until after the credits, go back and do so to see that Morgan (in full Denzel in Book of Eli mode) has found his way to the church and is now looking to catch up with Rick. I bring this up because Lennie James is awesome and watching wordless scenes of him in this show made up for a lot of the rest of the episode. His presence is something different and something more intriguing than watching Rick have to deal with yet another tyrannical leader type on a quest to maintain power. 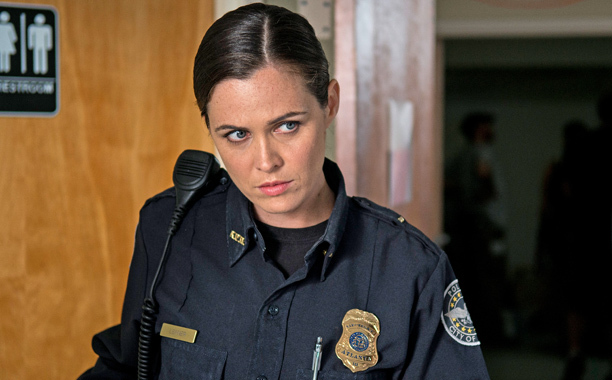 Now that we have left Grady Hospital, I can only hope that the rest of this season will give us some new territory to chart or some new areas to explore, such as what it is that has Morgan trying to find his old buddy. Last year took on the task of splitting the group and doing some ambition work in providing more personal episodes. Given that I still think this season has the potential to be the strongest for The Walking Dead so far, I can only hope it finds a new ambitious approach that really works out for the next 8 episodes. Zombie Kill of the Week: That zombie that tripped, fell face first into a machete, and split her wig, yeah, she’s a winner! I really enjoyed the editing of the opening segment, which all led up to Officer Bob getting Rick Rolled. “Can’t go back Bob.” – Yeah, this is the badass Rick I enjoy. Do all the cops just need to have their ‘evil’ switch turned off at the hospital, or what? Carol woke up and also looked confused by the lack of finality for her character arc in this opening half season. Ding Dong the Dawn is Dead. Looking forward to seeing what Morgan brings to the group, when he finally meets up with them. Until then, thanks for reading and I’ll be back with Rick and the gang in February. Thanks for reading and feel free to hear what myself and a few other fans of the show have to say about the series on the The Walking Dead TV Podcast.